The Quonochontaug Grange Exploratory Study Group and the Friends of the Quonochontaug Grange, Inc. is a grassroots group of volunteers committed to the preservation and maintenance of the Quonochontaug Grange as an historic community resource and meeting place. Whether life-long, recent or seasonal residents of greater Charlestown, we recognize the importance and significance of the Grange as a gathering place for community members to come together for meetings, events, voting, meals and other purposes to enjoy the neighborly spirit upon which our community has been built. In response, approximately 40 members of our community appeared before the DCFD Operating Committee in April of 2015 to express their desire to preserve the Grange and compile a plan for its long-term operation and maintenance. 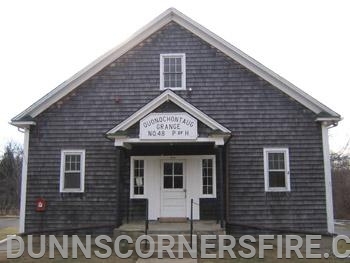 Those people were the first “Friends of the Quonnie Grange” and have formed a Rhode Island domestic non-profit corporation, Friends of the Quonochontaug Grange, Inc., which will work to compile a long-term plan for the Grange building to take effect June 1, 2016. As we do, we are very mindful of DCFD’s efforts to maintain and preserve the Grange. In the last few years, DCFD has invested in major improvements to the Grange including installation of a fire suppressor system, upgrade to electric service, handicapped ramp, and replacement windows for the meeting area. The Fire Department has given many man-hours to make improvements and repairs to the Grange facility and grounds. We are very grateful for all of its efforts and those of the many volunteers. As we enter our second year, we are asking you and all of our other Friends to renew or establish their memberships as official “Friends of the Quonochontaug Grange” for June 2016-May 2017. Be assured that your support, along with our ongoing efforts, inure to your benefit and that of our entire community by insuring that the Quonochontaug Grange building should be available for many years to come. The Grange is suitable for small and large meeting uses including: private parties, celebrations, picnics, receptions, organizational fund raisers and meetings, community wide events, all at reasonable rental fees. Send us an email to rentals@quonniegrange.org to reserve the Grange for your meeting or event.